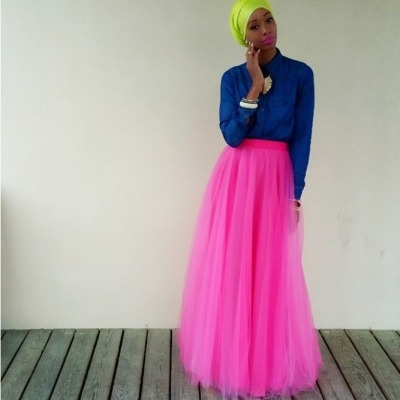 Whatever you call them, Muslim women who use social media to highlight their love of fashion and creativity have become all the rage. This phenomenon, spurred by the daunting task of finding fashion forward clothing, has even made its way into mainstream media. From the very beginning, hijabistas created a symbiotic relationship between their followers and the showcasing of Muslim or Muslim friendly companies/products. With this explosion of Islamic fashion internationally and domestically, these fashionistas in a hijab have gained more notoriety. When done with purpose and good intentions, blogging can be a great way to connect local communities to global companies and bring new trends and ideas to Muslim women from the area. Companies who recognize the inherent value in having a well known hijabinista be the face of their product tap into that potential. As a result, we see many of the more popular bloggers working with and advertising the products of major companies and events thus bringing notoriety to the product and an increased following. It’s a mutually beneficial relationship for those who get to participate, but what about those who don’t? Unfortunately, there seems to be a hierarchy of desirability that leave many hijabinistas/models of African American descent out in the cold. In fact, one of the reasons I decided to jump into blogging was the lack of representation of Black American hijabis in the media. At the time that I started PHKI there were only three major African American girls that I knew of who blogged, one being Labella Iman and the others Nadira and Najwa of Muslimah 2 Muslimah. Outside of the aforementioned, most hijabi bloggers and media representatives all tended to have a similar look, the exception of course being Basma K based out of the UK. In addition, many of the models used to promote the products geared towards Muslim women tended to always be one note. The lack of diversity was glaring but what could be causing it? Why were/are Black women hijabistas, models and media personalities so poorly represented/promoted? One could argue that it’s a matter of personal preference and has nothing to do with race. However, as organizations like Muslim ARC (Muslim Anti-Racism Collaborative) continue to grow, it would be hard to ignore the blatant and latent forms of racism that often times manifest itself in more “superficial spheres” such as blogging and social engagement. Many will stop reading at this point and dismiss these words as rubbish but when you have a list coming out every other day that lists Muslim Women on the rise in various fields including fashion and said list has little to no Brown faces…there’s a problem. When bloggers like Nadira of Nadira037 has been blogging for years (before any of the more popular gals came onto the scene) yet her blog still doesn’t have the numbers that other hijabistas have accumulated in a shorter period of time…there’s a problem. When only two of the numerous popular Muslim clothing brands, Inayah and Artizara, can readily be named who feature visibly Black models…there’s a problem. Certainly, being visible, persevering and simply existing in a space that traditionally does not have many women of African descent can help change things as Zaynaab and Hakeemah both stated. Others like Nadirah Angail try to shine light on these little recognized women by putting together lists that showcase the diversity of Muslims. Her post “46 Muslim Women Shining Their Light On The World” was a shining example and featured media personalities, bloggers, writers, doctors, etc. from the African Diaspora. Most importantly though, we must write and discuss the issue head on no matter the difficulty or push back that one may receive. Only through recognizing and addressing the problem can we move forward and become more inclusive as a community. And if following awesome blogs is your sort of thing and yet you aren’t familiar with Hakeemah, Shaeedah Sween, Zaynaab Le’Von, Nadira037, Naballah Chi, or Sakeenah Rashid of Hijab Style and Fashion Ebook…then your are certainly missing out on what these talented and beautiful women have to offer. Keziah Ridgeway is a History Teacher and Writer/Blogger based out of Philadelphia. This post was originally published on reMARC by MuslimARC. When discussing this I might add that there are several other categories of Muslim women that are also even more left out of the recent empowerment/fashionista craze, these would include women over 30 and converts. In addition, there is a strong sentiment that Muslim women who choose not to cover their how are not interested in modest fashion, which we are. Discrimination against non-hijab wearing women is not talked about but the truth is we are excluded and ostracized in many ways, often only finding acceptance in the most progressive organizations. There are many other online stores, blogs, businesses too that focus mainly on the left out categories like plus sized women, women who need customized clothing, women with darker complexion. All these women are now being kept in mind. They are just needed to be promoted more and I don’t think it will be a problem anymore. It’s fair to say in the past 2 years, there has been a positive change to be more inclusive of muslim models who do not fit the stereotype fair skin image required to showcase hijabs or abayas online. Ikram Abdi Omar or Halima Aden are just 2 examples who have started this mainstream change and having the chance to work with major brands such as Vogue or Nike. I do agree, we lack promotion in the Muslim community and often can be very judgemental which is not helping the cause. Our brand objective for this year includes promoting darker complexions which can be seen in our upcoming abaya collection. A woman wearing hijab enters the 7 train. She glances around and smiles, searching for a friendly face. Heads turn and eyes stare back. A strange silence envelopes the subway car. The woman walks towards an empty seat and sits down, selects a new song on her IPod, sips from her coffee and closes her blue eyes. She pretends she doesn’t notice the stares, the tension and the energy in the air. She asks God to surround her with healing energy, love and light.